Note: All brand icons are trademarks of their respective owners. The use of these trademarks does not indicate endorsement of the trademark holder by me, nor vice versa. The issue with doing plain HTML is that is not your final format. Plain HTML cannot have shared headers and footers that are the same throughout pages. It cannot have variables, multiple outputs, multiple formats or anything else. Changing the header of one page, you need to change the header of all other pages, manually, one at a time. The same for any other shared values such as page links that could be anywhere in the pages. Once you start converting your website to your final server code (cshtml for example) the issues really start. Now you have 2 separate codes to maintain (static HTML and cshtml). Now we can create all our pages in regular HTML format, but with comments to insert the header and footer. To modify the output filename and path (relative to the input file), in your dnaweb file specify the new name in the output tag. You can specify more than one output to generate multiple files with different names in different locations. Some files like headers and footers should not generate files themselves, they are simply partial files to be included. Another useful feature is the ability to create variables that can be inserted anywhere in the HTML. A good example is using them for page titles and URLs. <p>Get the source code <a href="$‌$HomeUrl$‌$" />here</a>. To create variables, first start a special code block comment using <!--$ and ending with $-->. Inside that place the tag just like a HTML tag. Inside the data element you can now create variables with names and values just like any XML/HTML element. As well as defining variables yourself, DnaWeb has a bunch of in-built useful variables, you use in just the same way with the prefix dna. Sometimes you need multiple outputs of a single file. For example the static HTML output and the server cshtml file. Profiles allow you to specify a name for a profile, then customize variables, output filenames and more. As you can see, you define variables as you normally would, except you can provide a Profile attribute to the variable which means that variable only applies to outputs that define a profile name that matches. You can also create a Profile element and then any variables inside of that element automatically get that profile name. Finally, to generate an output file that uses a specific profile and so specific variables end the filename with a colon : and then the profile name. As with output profiles, you can use the same profile technique to only include files for specific profiles. The perfect use-case for this is ASP Net cshtml files that use a layout file. As such all cshtml files of specific pages don’t include a header and footer, they simply specify the layout to use or the default one is chosen. Here is an example that generates a full static HTML page called index.html and an ASP.Net index.cshtml page that doesn’t include the header or footer. As you can see by specifying a profile named wrapped then setting the index.html output to use that profile, and the includes for the header and footer to only include the files for the profile wrapped we end up with just the header <h1> in the .cshtml file but the complete file for the .html file. You can inline data that will get inserted for all outputs, for outputs that do not specify a profile, and for specific profiles. As you can see, just like outputs and inputs, you can add a colon : then a profile name to the end of the inline name statement. NOTE: The bang (!) instead of a profile name means to only include if there is explicitly no profile selected. Without the ! the inline would be included for outputs that specify a profile as well as those that do not. The engine is not limited to HTML files, it was simply created initially to aid in the general static web development, however it’s really a universal engine. When working with ASP.Net files you typically end up creating links between the HTML and the back-end C# code. As such, it would be great to be able to share variables between the two. With the help of DnaWeb you can. Say you have a menu element you want to access from the C# ASP.Net side through the DOM and you need the element ID. Typically you would have the ID value stored in ASP.Net in a code file, and you would have the ID typed into the html/cshtml file as well. You would have to keep both names the same and if you edit one you need to remember to edit the other. Instead, using the C# engine you can specify the ID as a variable and use it to generate both the cshtml file and a C# code file. Notice the use of a new element called a Group. A group simply groups a bunch of variables and will be used to automatically add #region areas to the code file. You can still give the variables profile names and anything else you do with a variable. That will generate a new C# class file and replace the <!--# properties #--> value with the variables inside the group SharedVariables. The variables will be generated as public properties of the correct type (string, boolean, int etc..). The comments for the properties will come from the comments specified in the variables file. The variables will also be wrapped in a #region with the same name as the group. DnaWeb has the ability to process Sass files (.scss) and generate .css files from them. Simply run DnaWeb in the directory of your choice and any .scss files will automatically produce css files as they are changed. Now with DNA Live Servers you can. Also the ability to watch live in a browser for file changes and refresh the page automatically is very beneficial. This feature is also included in Live Server. To have DnaWeb spin up a server for you automatically on a free port on your local machine, and start serving the html and other content files in a specific folder, just specify an array of paths in any dna.config file. The paths are relative to the dna.config file location. For example, the Examples folder in this repository has a folder called 09 - LiveServer and inside it the DnaWeb source files are there. The dna.config file specfies that the output (html) files go to ../Outputs/09 folder, and so we also set up a Live Server to that folder too. Now just start DnaWeb in your source folder and a Live Server will be created and your browser automatically opened to the new server address, along with the index.html file in the Outputs/09 folder being served by default. If you then typed in http://localhost:51767/about for example it would attempt to find and load a html file in Outputs/09 called about.htm (or .html). Any other requests such as http://localhost:51767/Assets/Css/style.css will then look for Outputs/09/Assets/Css/style.css and serve that. Mime types will be honoured, and the server will server the files length, date, modified date and so on. Go ahead and edit a .dhtml file, a .scss file or even a file directly in the output folder if you like, and watch the website automatically refresh. A Live Data Source for DnaWeb provides the ability to include and instantly make use of snippets and variables live while working on your web project. This can be very useful for rapid workflow. The source folder contains a readme.md file explaining the Live Data source, what who made it, what's inside and general information. Save the file and if your editor (such as VS Code) supports live updating of the file you will instantly see what you typed gets replaced with the actual contents of the Live Variable named variablename inside the Live Data Source with a prefix of dna. As well as small variables/snippets it is also useful when developing a website to start from an entire template, such as a full responsive website blank template. Where name is the Live Template's prefix.name, for example dna.blank for the Blank template from the DnaWeb official Live Data Source. Instead of having them in the output folder tpyically called WebRoot along with mostly compiled/generated files, making it an ugly mix folder between generated files and static files, you can create a Static Folder anywhere you like and configure it to output to a specific location in your web root. A good example is an Assets folder containing Fonts and images. Check out the Examples folder for more information, specifically the Static Folders example. Once installed on your system, DnaWeb will be a self-contained .Net Core application in your Program Files folder under DnaWeb. This installed path will also be added to your systems PATH variable. This means you can run DnaWeb from anywhere in command line. Let's say you have a folder now containing your website, its assets, images, css, html, dnaweb files and so on. At the start of your work day, you would just navigate to that folder in Explorer, then in the address bar type dnaweb to open and run a DnaWeb engine in that folder. This simply finds the self-contained DnaWeb.exe file located in the Program Files installation folder, then runs DnaWeb. DnaWeb will first load the default configuration file from the install folder, and then look in the executing folder (where you ran dnaweb from command line) for a configuration file also, and load in your custom project settings. Finally it will check any command line arguments and load those. That is also the order of precedence so the arguments override the project folders configuration which overrides the default configuration. Now just edit/create your files and DnaWeb will process them automatically. Once done press enter twice to exit DnaWeb. If you would like continuous integration, or run a build server, or simply want to make sure every time you build your Visual Studio project that any DnaWeb files are processed, you can run the engine as a pre-build command to Visual Studio to run every time you build your project. Open up the Source folder, then the Dna.Web.sln solution file. With Visual Studio open make sure Dna.Web.CommandLine is set as the startup project. If not right click Dna.Web.CommandLine and select Set as Startup Project. Now press F5 to run the engine. This will run the engine, opening a command line window that should output where it is listening for file changes and state Press enter to stop. 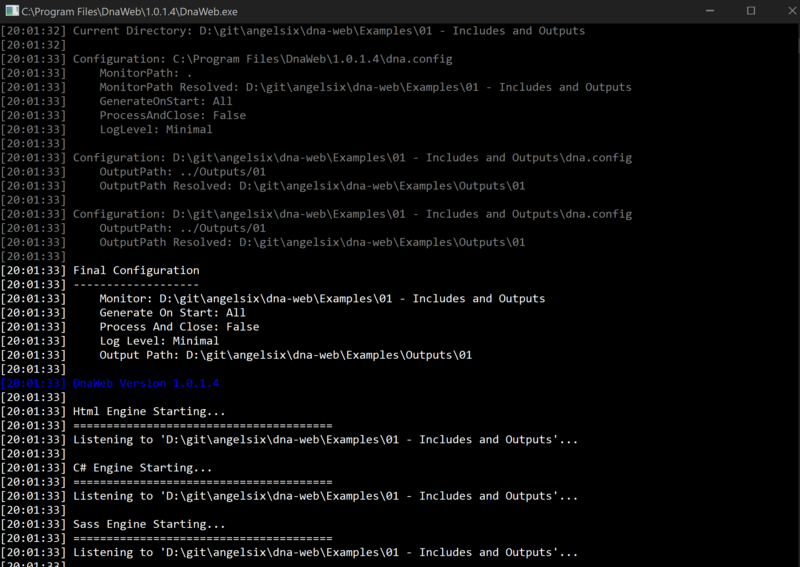 By default the engine looks in the folder it is run in, so from Visual Studio that is the Dna.Web.CommandLine folder. Settings such as the monitor path, whether to generate all files on start, and whether to close right after can be set in a dna.config file in the same directory where you run DnaWeb from. You can also place a dna.config file in any sub-folder inside the monitor path to apply settings to that specific folder and it's children. Configuration files in child folders override any settings specified in a parent folders configuration file. The Visual Studio project has a debug argument set to monitor=../../Examples so that when debugging it monitors the Examples folder of the solution. Now with the engine running, edit any file in the Examples folder and the console will detect the change and automatically process the files and generate the outputs. All details are output to the console window. The typical work-cycle when using DnaWeb is to start the engine up prior to working, then work with your DnaWeb files as required, meaning any edits to those files will auto-generate your HTML/C#/Sass files instantly..!